BIRS-CMO Research program on "Bayesian Nonparametric Inference" at the Banff International Research Station -CMO [Co-Chair]. Oaxaca, Mexico (Dec 2017). Simposio de Inferencia y Modelación Estadística [SC]; Guanajuato, Mexico (Nov 2016). France - Mexico Meeting on Data Analysis [LOC]; CDMX, Mexico (Nov 2016). XXXI Foro Nacional de Estadística [LOC]. Texcoco, Mexico (Oct, 2016). 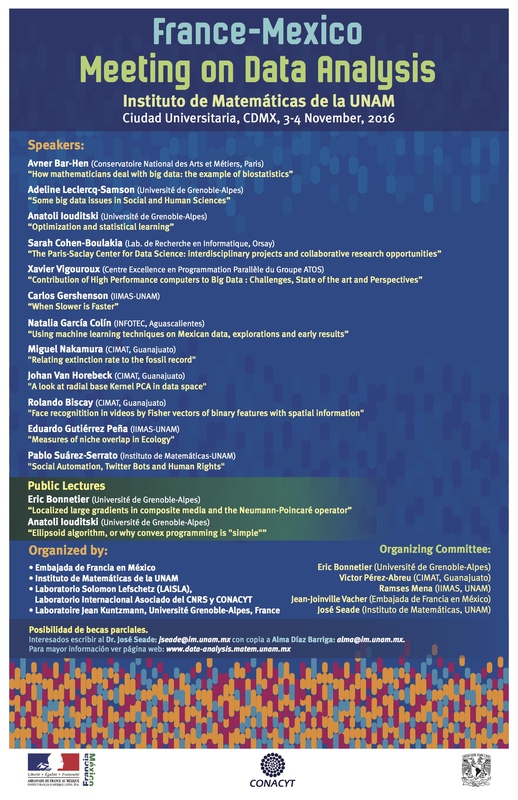 1st Latin American Conference on Statistical Computing [SC]; Gramado, Brasil (Jul 2016). ISBA 2016 World Meeting [SC]; Sardinia, Italy (Jun 2016). ISBA 2014 World Meeting [LOC,SC]; Cancún, Mexico (Jul 2014). BIRS Banff Research program on "Random Measures and Measure-Valued Processes" at the Banff International Research Station [Co-Chair]. Banff, Alberta (September 2013). Coloquios Conmemorativos del AIE en Probabilidad y Estadística , CIMAT, Guanajuato (March 2013). XI Symposium of Probabability and Stochastic Processes [LOC, SC]; Guanajuato (Nov 2013). 8th Workshop on Bayesian Nonparametrics. [Co-Chair,LOC,SC]. Veracruz, Mexico (Jun, 2011). 35th Conference on Stochastic Processes and their Applications [LOC]. Oaxaca, Mexico (Jul, 2011). 3rd Mexican Workshop on Bayesian Statistics. [LOC]. Veracruz, Mexico (Jun, 2011). 24th Foro Nacional de Estadística[LOC]. Texcoco, Mexico (Oct, 2009). 2nd Latin American Congress on Bayesian Statistics [LOC]. Los Cabos, Mexico (Feb, 2005).